Whitney Plantation Main House in the Whitney Plantation Historic District. 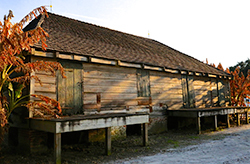 Historic district buildings include the French Creole Barn, pigeonnier, and cabins for enslaved plantation workers. The Whitney Plantation Historic District is located on a 3,000-foot stretch of the famous, historic River Road in St. John the Baptist Parish, Louisiana. 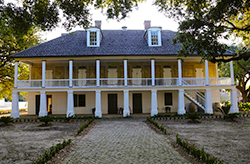 Aside from the raised Creole main house, originally erected in 1803, the district contains an overseer's house, a rare French Creole barn, a manager's house, a plantation store, a two story tall pigeonnier (structures used by upper-class French for housing pigeons), and the 1884 Creole and Greek revival style Mialaret House, as well as other sites of historic interest. The Creole mansion and dependencies are grouped in a cluster, which forms the focal point of the district. Sugarcane and rice were the principal crops during the historic period, and Whitney's fields are still planted in cane. The district's plantation house is architecturally important statewide as one of Louisiana's most important examples of Creole architecture. Nationally, the art produced within the Whitney Plantation House, including the wall murals dating between 1836 and 1839, are important. Whitney's surviving French Creole barn is the last example known to survive in the State. The plantation that came to be known as Whitney appears to have been founded by Ambrose Haydel. A German, Haydel immigrated to Louisiana with his mother and siblings in 1721 and married shortly thereafter. Ambrose Haydel and his wife may have lived on the Whitney land tract as early as 1750. By the end of the 18th century, Haydel's sons, Jean Jacques, and Nicholas, owned adjoining plantations which included and expanded upon their father's original holdings. It was apparently Jean Jacques who built the Whitney main house around 1790 and expanded it around 1803. In 1820, he sold the property to his sons Jean Jacques, Jr., and Marcellin. Marcellin eventually gained total control of the rest of the family's land, and commissioned the 1836-1839 remodeling. The plantation remained in the family's hands until it was sold to a Northerner, Bradish Johnson, after the Civil War. It was Johnson who actually named the property Whitney in honor of his grandson, Harry Payne Whitney. The Whitney Plantation Historic District is located at 5099 Hwy. 18 in Wallace, LA. Guided tours of Whitney Plantation are available every day except Tuesdays from 10am to 3pm. Whitney Plantation is closed New Year’s Day, Mardi Gras Day, July 4th, Thanksgiving Day, and Christmas Day. There is a fee for admission (no fee for children under 12 and discounts available for groups over 10; Seniors; Students; Active duty serivce; Residents of St. John or St. James Parish). Groups are encouraged to book online or call ahead. Contact Whitney Plantation at 225-265-3300 or visit the website for more information and online booking.